Time for another movie review! Yesterday, I reviewed Contracted, which attempted to take a well-known horror subgenre and turned it on its head (poorly, while also falling into many annoying horror tropes). 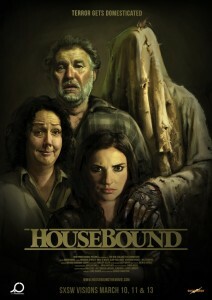 Today, a movie that turns a subgenre on its head and does it really well: Housebound. Kylie is a habitual offender, who is caught trying to steal an ATM. Her lawyer tries to get her placed in a rehabilitation clinic, but the judge notes her history of recidivism and argues that these programs, which she has been sentenced to before, have not helped. Instead, he sentences her to 8 months house arrest at the home of Kylie’s mother and step-father, Miriam and Graeme. We also meet Amos, the security guard in charge of her ankle monitor, who puts it on and shows us how it works. Kylie has a very poor relationship with her mother and step-father, and continuously ignores and demeans them, while sitting around drinking, watching TV, and binge-eating. One night when she tries to use the house phone, after misplacing her cell phone, she finds Miriam on the phone with a talk show, talking about her potentially haunted house. Kylie doubts this story and thinks Miriam is just trying to get attention, until she goes into the basement one night and a hand reaches out and grabs her ankle, setting off her ankle monitor. Amos shows up to see if Kylie tried to tamper with the monitor, and Kylie tells him someone is in the house. When they find no evidence of an intruder, Miriam tells Amos about her theory that the house is haunted. Amos believes her immediately and accuses Kylie of having a closed mind. Amos, who it turns out is an amateur paranormal investigator, returns the next day to set up video surveillance equipment and help figure out if the house is haunted, and by whom. The movie is described as a horror comedy, and there are some very funny moments, such as the Teddy Ruxpin-like doll that says creepy things to Kylie and corners her in the shower, as well as the interactions between Amos and Kylie. That being said, the movie has some legitimately creepy moments, with funny moments interspersed to lighten the mood, but fortunately without detracting from the mystery and suspense. What could have been a by-the-book haunted house movie is able to take those tropes and turn them around, making something new and different. Well-written lead characters that avoid the horror stereotypes also keep things interesting, and keep you engaged. As is often the case in horror movies, though, there will be moments where you find yourself shouting at the character, "What are you doing?!" But, unlike other horror movies, you'll probably laugh at the same time. As I said, there are some legitimately creepy moments, so it doesn't come across as a parody, though it might technically be a parody of horror as a genre (rather than specific movies, like Scary Movie). If you like super-creepy horror, you might not care for this movie as much, but if you like your horror with a good dose of comedy - like much of the old school horror, such as The Nightmare on Elm Street series - while still having a few creepy chills, you'll like Housebound.